IM2O……..be inspired | Want to travel, learn, inspire and be inspired…. Want to travel, learn, inspire and be inspired…. It’s now over a week since we came back from pilgrimage and what an amazing experience. Doesn’t take long to get into the swing of daily routine and the only thing we have to hold on to is our memories. Our stay in Jerusalem was too short and very rushed, it’s an ancient place with a very rich history and you fall in love with the place immediately. The city is full of inspiration and your eyes need time to take it all in to invoke feelings from the past when our Prophets occupied the same space. 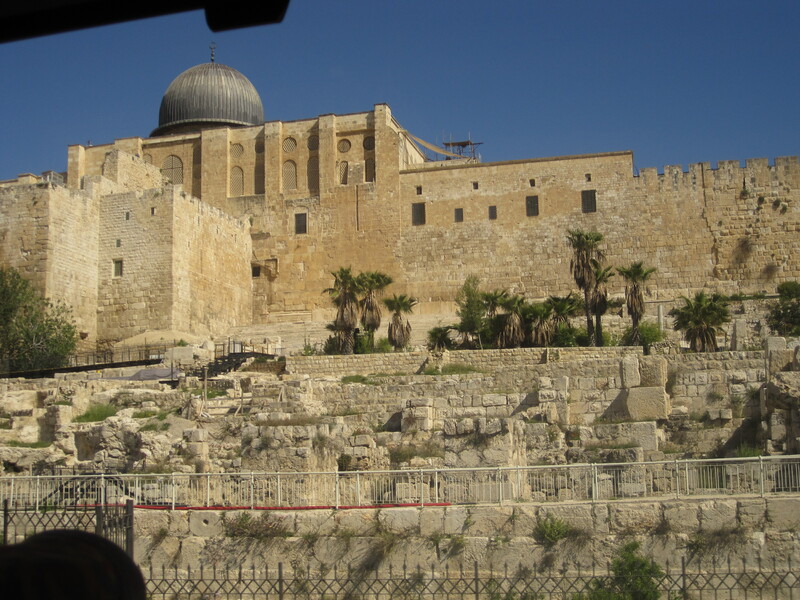 When walking around the sanctuary, you also reflect on the sacrifices many Muslims made throughout the history particularly the dark period of the Crusaders, when thousands of innocent Muslims including women and children were slaughtered. We also cannot forget the sacrifices made by Jewish and Christian faiths through the period of oppression. This is a place where pilgrims from all faiths have been arriving for centuries. I’m excited with the prospects of one day returning to Jerusalem spending time missed walking around the old city sampling local hospitality. The Palestinian people are very hospitable, humble and resilient despite the pilfering of their land, the Israeli oppression, restrictions, checkpoints and barriers reducing them to submission. They welcome you with open arms and in return all they ask is for us to visit again, encourage more people to come and see their conditions, to remember them in prayers for a free Palestinian state. I’m not going to give you a history lesson on the sacrifice and plight of the Palestinian people, or go into detail how through systematic occupation and displacement of defenceless Palestinian people Israel was created. We should also not be ignorant on the history and the situation of the Palestinian people, we need to show solidarity by visiting Palestine to experience their hospitality, strength of will and learn from their optimism in the face of occupation. This is a tourist destination and everyone from all faiths is welcomed despite the heavy Israeli police presence. This is for your own safety and you do not feel threatened or intimidated and it is very similar to visiting other countries. Hebron and Bethlehem were the two other places we visited on our second day in Palestine. 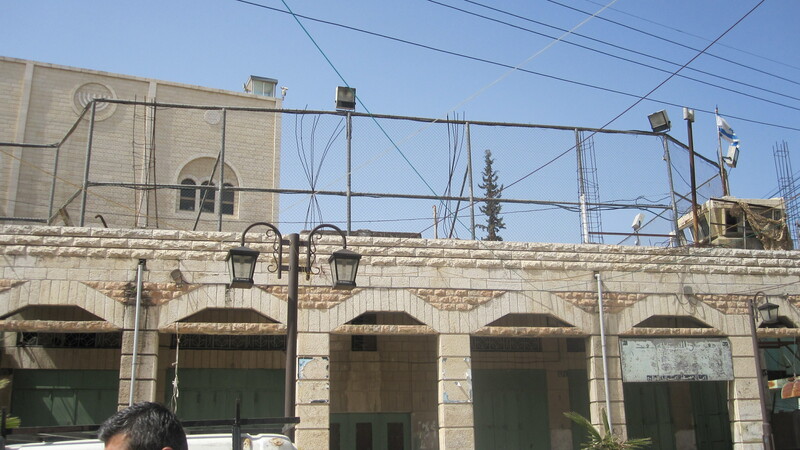 Both these places hold a special significance and it is heartbreaking when you see Jewish settlers in the heart of Hebron out of place, barricaded and heavily fortified by Israeli soldiers. 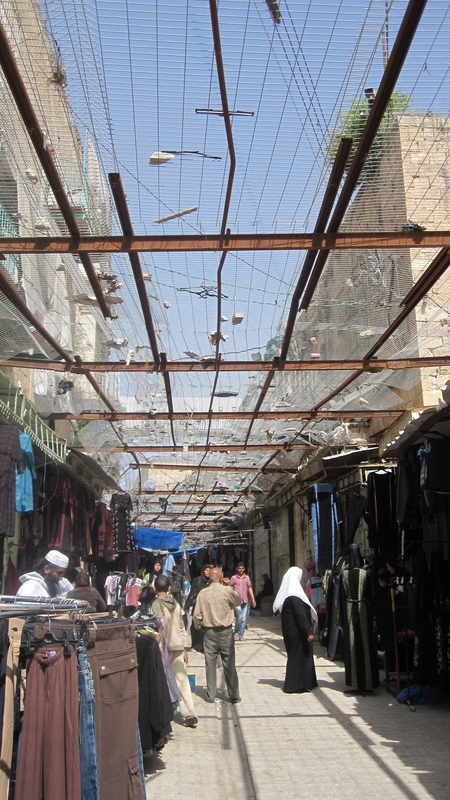 In Hebron, to avoid stones from kids of the Jewish settlers, the Palestinian traders have had to attach metal mesh over the shops to protect themselves and the shoppers! We were looking for an experience which included pilgrimage to Jerusalem, with a limited budget and one that offered Jumma in Jerusalem, Makkah and Madinah. We found one which met our requirements, I hadn’t heard of the tour operator until now although they were known to people in the travel industry. The hotels advertised were very basic but the price of the package was a bargain, with food included in Jerusalem! •	We managed to find a vaccination service charging only £15 per person through Council of British Hajjis. •	Whilst checking out various options to get to the airport, we were informed that a coach service was also included in the package.Bonus!! •	We could make our intention for Ihram from Masjid-ul-Aqsa for Umrah, to revive the Hadith. Our group had a diverse age range from 5 to 83 years and everyone was fun to travel with. We all had great stories to share and I was impressed with the group’s knowledge and travel experience. We had a spiritual guide (Alim), an expert on Jerusalem adding value to the package. On the way to Jerusalem we visited the tomb of Yusha Bin Noon (a.s), from here we could see the Jordan Valley and the mountains towards Palestine and Israel. Dropping down to the Dead Sea, the lowest point on earth, our next stop was the maqam of Shuaib (a.s) where we also prayed Zuhur in the Masjid. 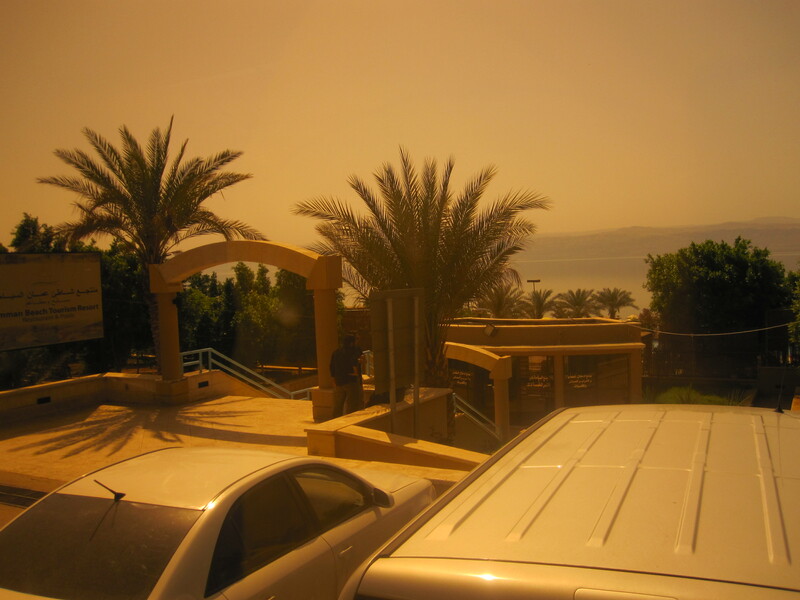 Our lunch was in a tourist resort with access to the Dead Sea. In Islam, severe punishment descended on the people at the time of Prophet Lut (Lot). The place called Sodom (Sadum) is now in the depth of the Dead Sea. From Jordan we headed for Allenby Bridge through no mans land to the Israeli checkpoint where our coach dropped us off with our luggage. The place was like a small domestic airport, your luggage was handed over and we queued up to enter immigration. When we got there, this was an eventful experience. We had previously been informed by our tour group about the possible situations whilst crossing into Palestine. As expected with the exception of families and elderly, all young single Muslim men were detained for background checks and questioning which took several hours. This is nothing more than inconvenience and is fuelled by paranoia. 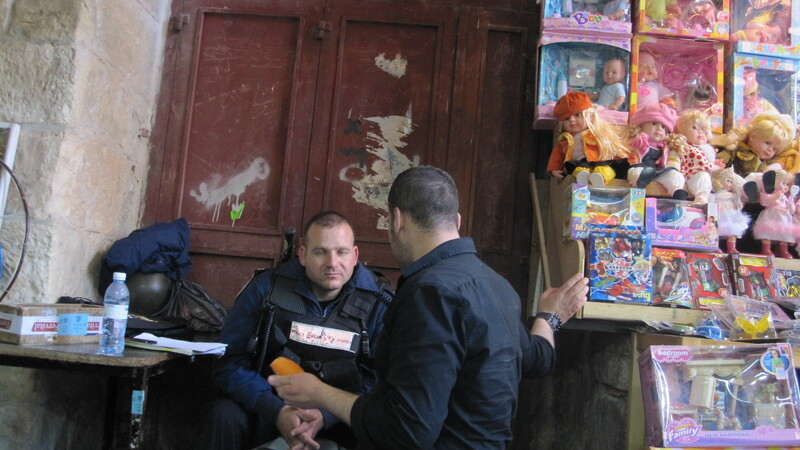 Majority of the Israeli staff are friendly young adults doing their conscript service trying to avoid making mistakes. After praying Salaat and whilst waiting for the guys who were detained, we experienced further events reinforcing the tense situation at the crossing. We were all asked to leave our luggage and vacate the building due to a security scare. It was all very confusing and almost satirical; everyone was very relaxed with staff chilling out from the routine work. A Palestinian woman was hovering around our group after we came back into the building trying to blend in with our women folk! We learnt that she wanted her luggage to be taken out with ours to avoid custom charges. I wonder what she had in her luggage for all the custom charges she eventually had to pay! The coach driver was getting restless waiting and the hotel wanted our group to check in and make way to the restaurant. The guys who were detained agreed to follow in a taxi after they cleared immigration which turned out to be a few hours after we left. 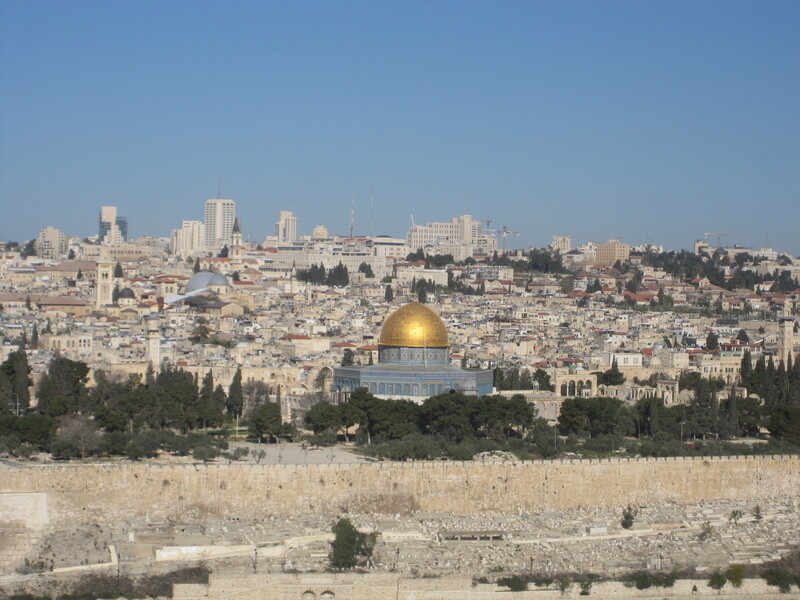 The ‘7 Arches’ was situated on Mount of Olives surrounded by Jewish Cemeteries. We had the best views of Jerusalem and despite all the travelling we were full of emotional excitement to have finally arrived. At every entrance to the Haram are Israeli police checkpoints to ensure only Muslims were entering. Anyone who looked doubtful was asked to show their passport and prove they were Muslims, by reciting Surah Fatihah. This happened to a few of the guys in our group. At first it was funny and whilst they are safe guarding the interest of Muslims it became a little frustrating when it happened on every single occasion, especially to the same people! 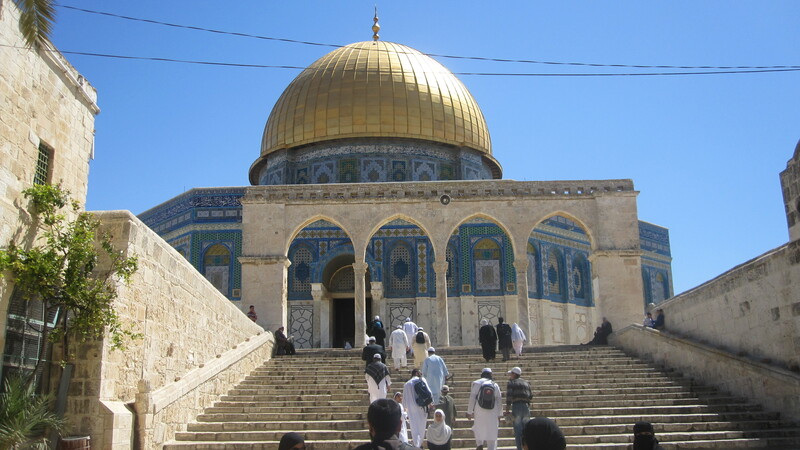 We’re very lucky as foreign Muslim tourists; Palestinian people from outside Jerusalem have to apply for a special permit approx 2 months in advance to be allowed to pray in the Haram on a specific date and time. 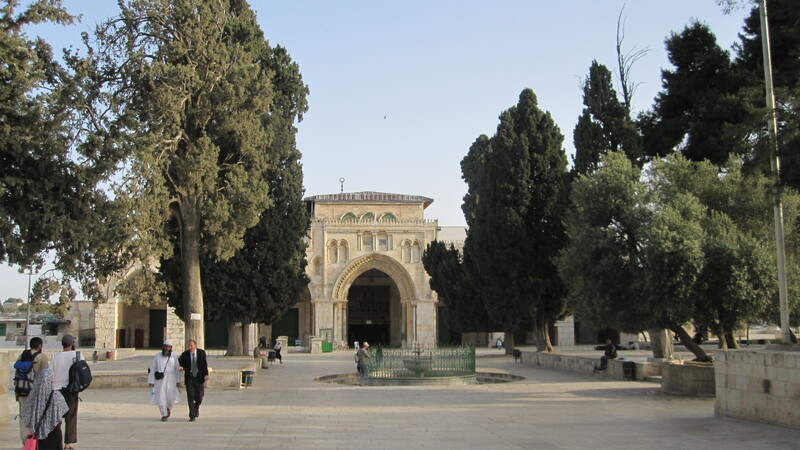 Non Muslims have a designated time in the morning to visit the Haram, some orthodox Jews will not set foot on the Al Aqsa compound as they view the place as the Holiest of Holies claiming it was the site of the original temple of Solomon or incase there may be remnants under the ground which they don’t wish to step upon. With the prospects of praying our first salaat in Masjid-ul-Aqsa, a few of us navigated our way towards Haram through the Jewish cemetery for Fajr. 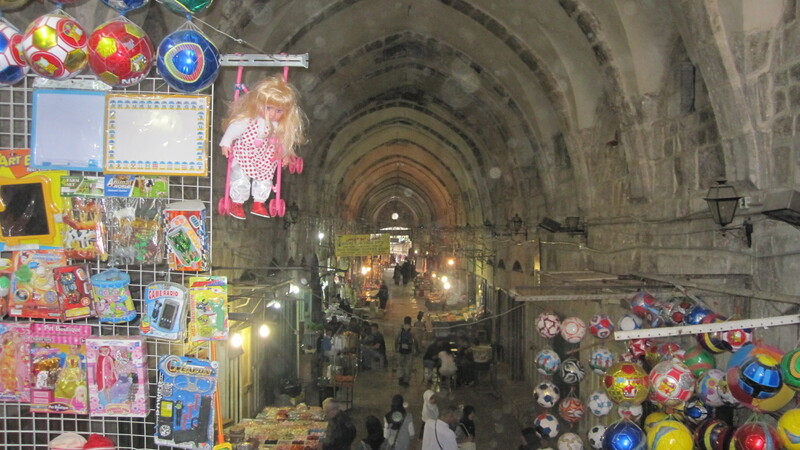 Once we were on the main road, we were fortunate enough to taste Palestinian hospitality with a lift to the Haram. The driver went as far as offering us a lift back but we ended up sitting for a while in the Masjid in awe of being in one of the few sacred places on Earth. After Fajr we walked around the grounds of Haram inspired by the importance of the place and the numerous significant events that took place, passing the Dome of the Rock with the euphoria of tasting the early morning atmosphere. We walked back to the Mount of Olives to the hotel, a perfect way to start the day! This is a truly special place, a magnificent graceful structure in an elevated position dominating the landscape. From here our Prophet Muhammad (s.a.w) ascended the heavens whilst the Jewish believe this is where Ibraaheem (a.s) placed Ishaaq (a.s) for sacrifice. 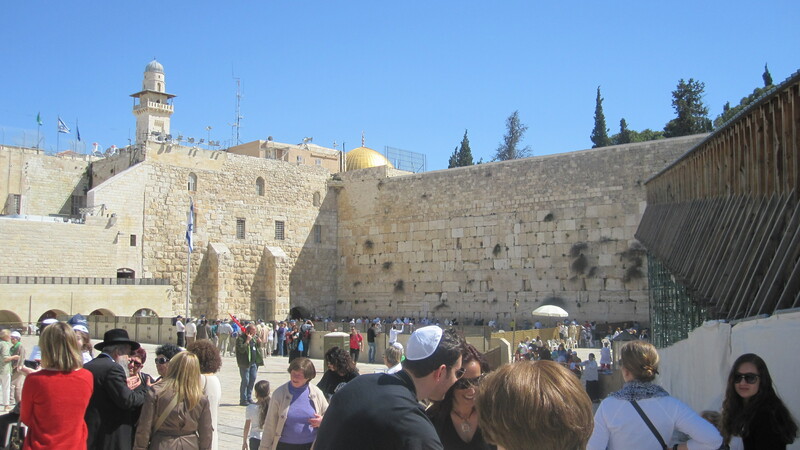 In the morning after breakfast we visited the ‘Wailing Wall’ open to all tourists with heavy security presence in the interest of everyone visiting. It was good to be there to get an understanding of the Jewish perspective. As it was the day before Sabbath, the atmosphere was very jovial, with musical instruments abound which made it a little difficult to listen to the tour guide explaining the Jewish customs! From inside this area as Muslims we were able to enter Haram through a large ancient stone tunnel. In the afternoon we made our way through the old alleys to the Church. 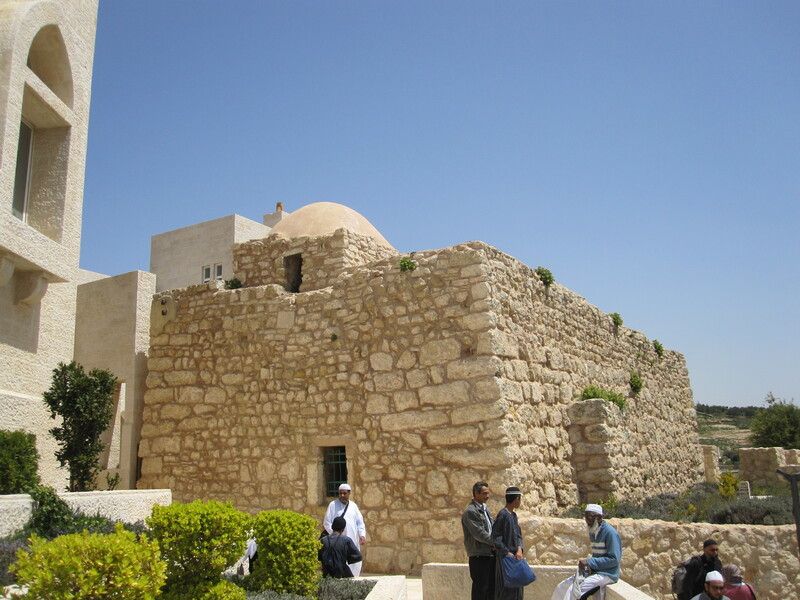 Whilst we believe Isa (a.s) ascended to heaven, this is the place where Christians believe Isa (a.s) was crucified and anointed. Within this place, a number of Christian factions share and claim territorial rights to parts of the Church which is why since 1192 two neighbouring Muslims families were entrusted with the key to avoid any conflicts between the Christians.They have the responsibility of opening the door of the Holy Sepulchre which still happens to the present day! 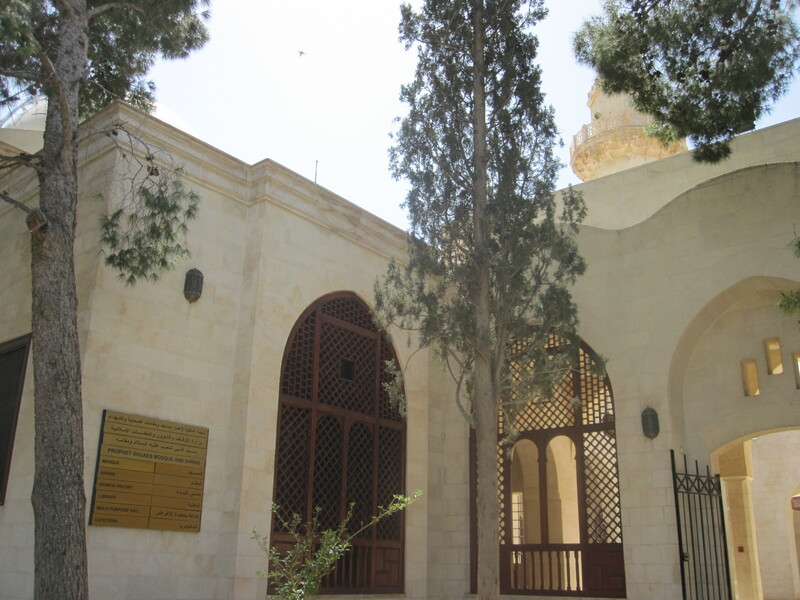 Next to the Church of the Holy Sepulchre is a Masjid representing the place where Caliph Umar (r.a) prayed Salaat after the conquest of Jerusalem. 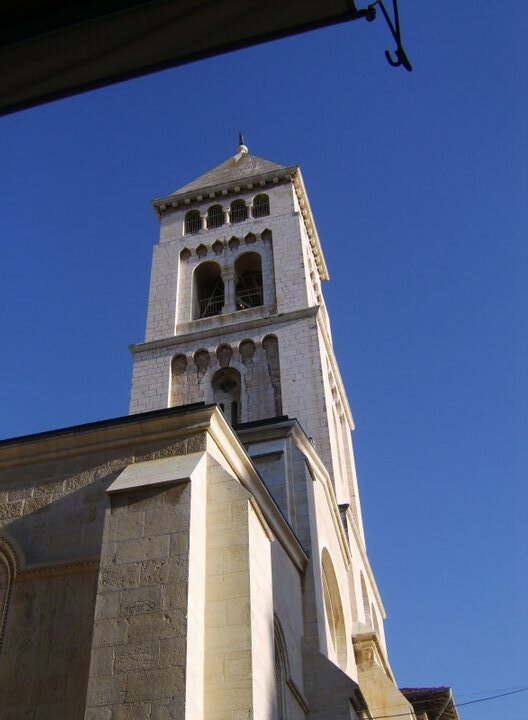 Legend has it that he declined the offer to pray in the church out of compassion for the monks, fearing that it would set a precedent for Muslims to claim it as a Masjid. 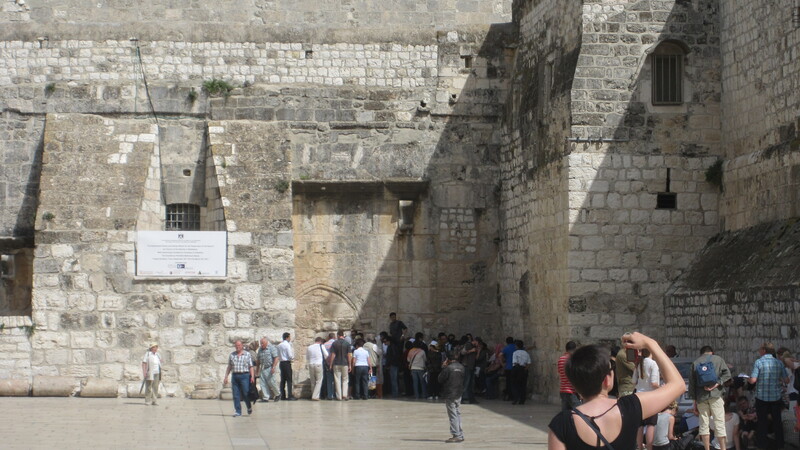 Instead he threw a stone from there to mark a spot where a masjid now stands, thereby safeguarding and protecting the existing Church of The Holy Sepulchre. Perhaps we could all learn from this lesson in tolerance and mutual respect. This is an incredible hidden treasure underneath the present Masjid-ul-Aqsa and was desecrated by the Crusaders when they used it as stables. 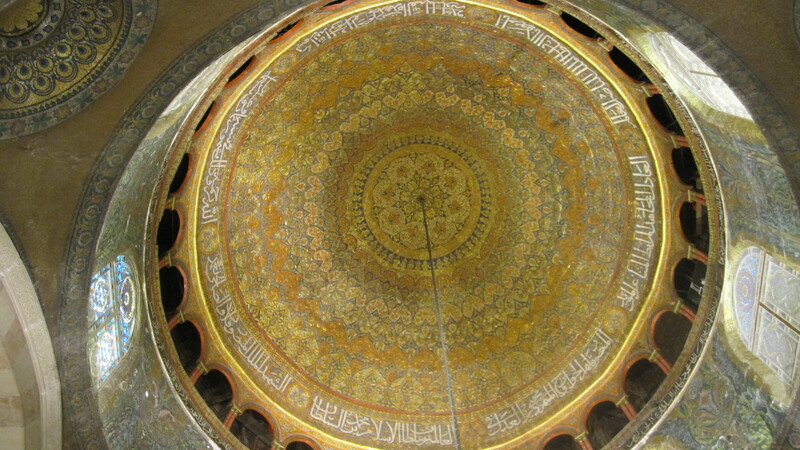 This is now being restored and used once again as a Masjid. I couldn’t believe the size of the boulders supporting the external walls wondering how they got there! Picture this, 33 of us including children walking towards Israeli immigration in ‘Ihram’ queuing up on the only desk open! When the immigration officer disappeared from our desk and reappeared in another we realised another delaying tactic to avoid processing our exit. With our patience it was not long before other desks opened up and we were able to spread out and get through immigration. You would think they would be glad to see the back of us! 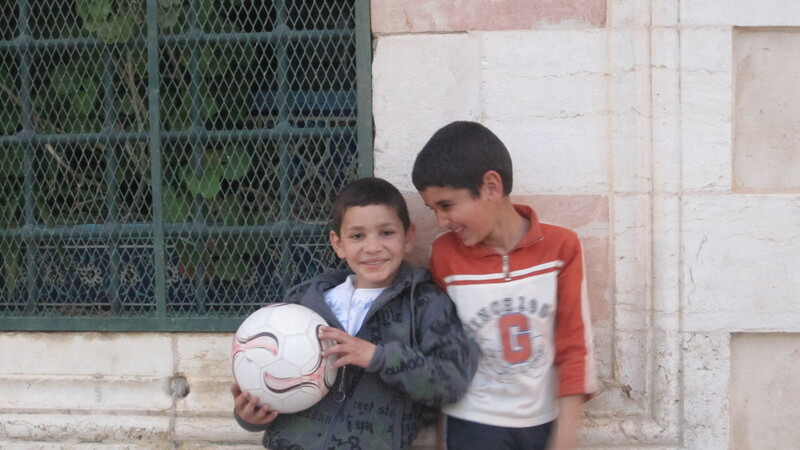 Emotionally this was difficult as we only spent two days in Palestine and our time in this beautiful place was over. 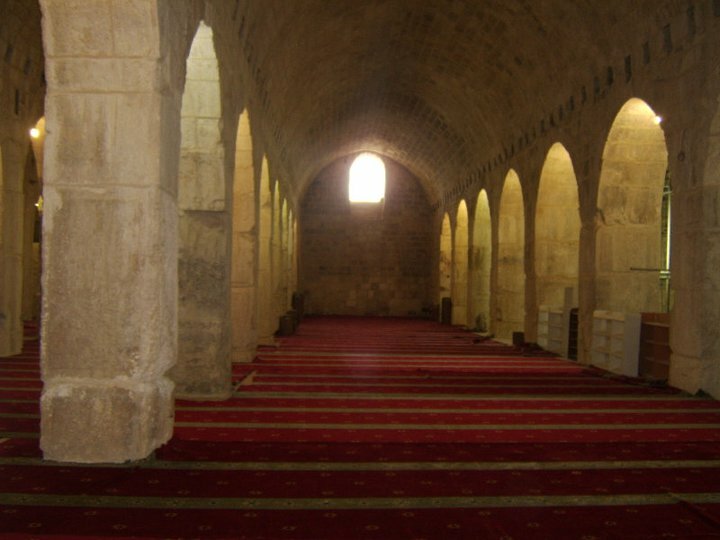 Muslim tourists from outside Palestine were very few in numbers compared to Christian and Jewish faiths. I pondered over the reasons for this and also tried to understand whether Muslims knew the real significance of this place. I could spend weeks here surrounded by so much ancient history giving so much inspiration. One year on, I am now reminiscing on my Everest Base Camp trek going over my journal. I am staring into the photos, thinking about the people I met, the conversations we had, the teahouses and the places we walked. It was a tough journey, both physically and mentally. You have to endure hardship, basic facilities and disturbed sleeping patterns. Your body doesn’t have time to recover fully and you carry the aches and pains from the previous days. You have to plan and adapt a routine that addresses your basic needs throughout the journey. 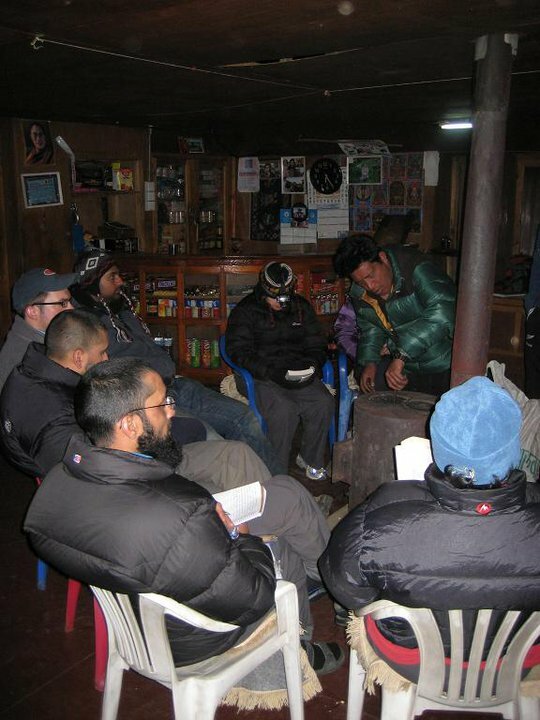 I was always listening to my body for any symptoms of altitude sickness, keeping to a comfortable pace, listening carefully to all the advice from the guides. You have added security of the experience in the guides and they continuously watch for any signs of discomfort which may cause a concern. Best of all, when you are walking amongst the Himalayan Mountains, you forget all the hardship; you’re captivated with the beauty of the place. You walk with like minded people, sharing inspirational and funny stories. Complete strangers become your friends and respect for each other’s life perspective grows. For me personally, the greatest achievement was completing this challenge without compromise to my religious observance. We were in an enviable position to show others that despite the differences in our faiths we too enjoy the great outdoors, have the same aspirations and similar mindset, the only real difference is our focus on the ultimate goal of attaining Allah’s pleasure. We had Halal food in Kathmandu and vegetarian choices on our trek, the guide made sure we had the biggest rooms in teahouses where we stayed for our prayers. The locals were very friendly and accommodating during the walk allowing us to pray in their kitchens and in the open. Would I do it again? Yes, most definitely! I would recommend this to everyone, the emotions you feel and the accomplishment will inspire you and stay with you for the rest of your life. Hi, I have just come back from my trek to Everest Base Camp, it was challenging, enjoyable and I was rewarded with breathtaking views! The locals were very friendly and accommodating, the guides and teahouses were very understanding and respectful. I was amazed by the resilience of the locals and the porters carrying goods through the mountains, even up to Everest Base Camp when I was carrying just a day pack! I sincerely recommend everything Nepal has to offer, to enjoy the great outdoors. 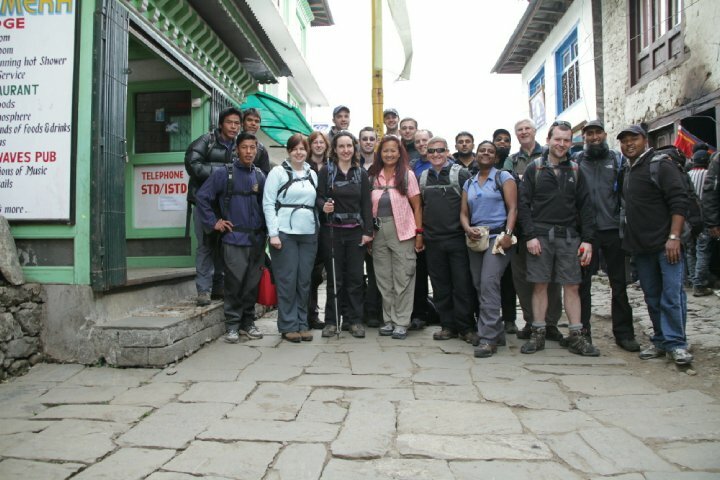 Nepal offers an experience to everyone, whether you are going as a family, a group of friends or on your own. Age and fitness does not matter depending on the adventure you choose! The guides are very experienced and perceptive. You feel completely safe in their hands and they go over and above their responsibilities when required. Your safety and enjoyment is their top priority! Back from my trip to Nepal and Everest Base Camp, what an adventure, rewarded with amazing views and fascinating company! Top of the World!! 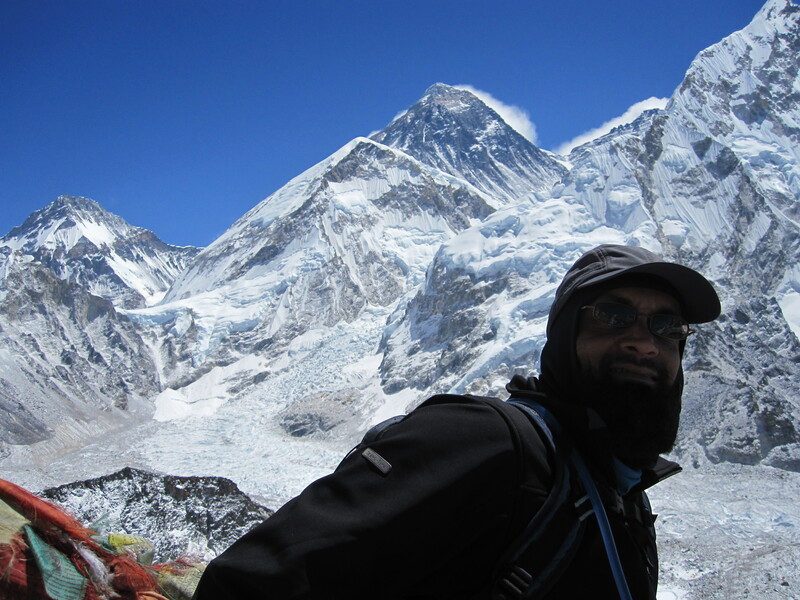 Standing on Kalar Patar with Everest behind me! Are Hajj agents ripping us off? For years most of these Hajj and Umrah agents have been taking advantage of our uncertainty, apprehension and pulling on our heart-strings when we are emotionally embarking on the most sensitive and spiritual journey of our lives. Most people have to save for years for this once in a lifetime journey, can they keep justifying these increases year on year? It’s the time of the year and family and friends are asking when I am going to organise another outdoor weekend for them, been busy with other distractions and not given this much thought, I need to think about whether I am going to keep this to North Wales this year or find another location which means I am going to be searching for another group accommodation which holds up to a 40 people…!